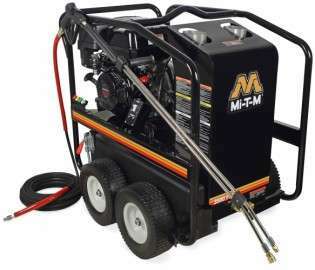 Mi-T-M HSP-3504-3MGH Hot Pressure Washer with Recoil Start in the most popular configuration. Please do not hold this price against the Mi-T-M units, these are built for the Pro’s and Industrial applications. With that said, they are not a price point setting and have a solid warranty and 45 years experience building in the USA! See the below benefits and the pdf brochure, especially the 2nd pg of the pdf for the detailed benefits of this unit. Please do not hold this price against these units when comparing to more expensive units and feel free to contact us if you have any questions. In an effort to compete with other online non-stocking dealers, the Price includes Freight to a Commercial/Business Address that is freight accessible with offloading by Customer for the posted price Direct from the mfg (avg lead time 1.5-2 wks plus shipping days) or…We do keep this model in our Physical Stock and available for same day shipping** to avoid a +/- 2 wk lead time. Please contact us for a freight add for this service along with lift gate, residential services, etc. if needed. In stock Rotary Cleaners on sale when shipped with our in stock units (last one of the two models at these prices) See below for details on model choices, but please contact us to order to adjust prices as necessary. AW-7020-8003 (black unit above) Normally $499, reduced to $355 when shipped with a HSP unit from our inventory. Only one unit remains at this price. Please contact us to process an order. AW-7020-8006 (stainless unit above) Normally $1,299, reduced to $979 when shipped with a HSP unit from our inventory. Only one unit remains at this price. Please contact us to process an order.